Why book Drum Team Collective™? Looking to Motivate Your Team? 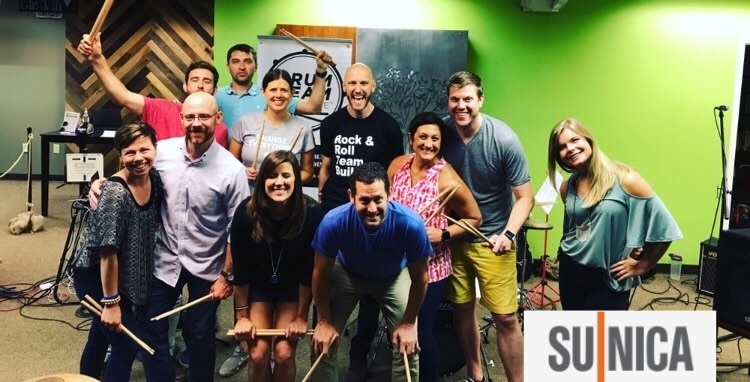 Check out Drum Team Collective’s Rock and Roll Team Building™! Unlike a traditional “drum circle,” Drum Team Collective™ puts your team members in the driver’s seat of a rock show! Its educational. Learn how drums are used in a musical setting. Its empowering and fun. Drum along with a live rock and roll band in a playful environment! Drum Team Collective™ is a refreshing way to build unity and leadership for your corporate team, organization, or private event. Our 90-minute indoor program will allow your group to experience the exhilarating feeling of drumming with an actual LIVE rock and roll band, while promoting communication and team bonding! Drum sets are separated into “stations” for each participant. A Drum Team Collective™ instructor will explain the role of each instrument and how to play it. The group will play drum patterns together and a live house band will join to plays well-known songs along with your team. Everyone will be able to rotate to try different percussion instruments. How long is the program and what can I expect during the event? 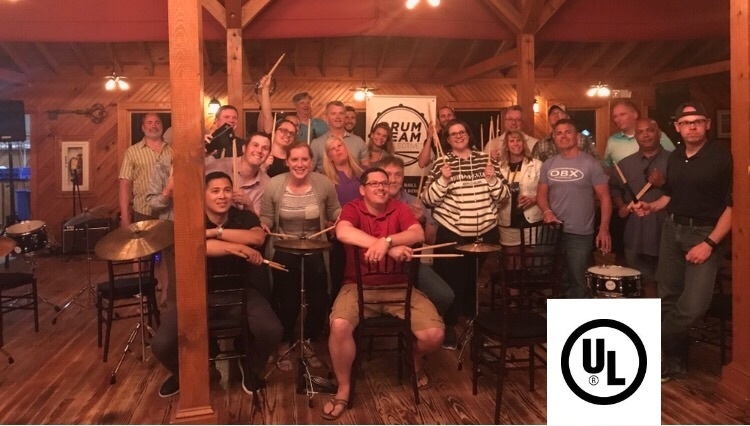 Standard Program is includes 90 minutes of focused team building and drumming along to Rock, 80’s, Pop , Country and R&B hits as well as various team building activities. History of the drum kit and the musical role of each element of the drum kit, relating drumming and musical performance to team building and leadership. Each participant will experience all the elements of the drum kit, playing along to classic rock and roll songs with a LIVE band! Burt’s Bees rocking out with Drum Team! Lenovo had a blast rocking out with us! Underwriters Laboratory’s international team at the Outer Banks of NC! Su Nica is a wonderful non-profit based out of Raleigh, NC…we had a blast together! Another great group from Underwriters Laboratory in the beautiful OBX! We love teachers! What a blast rocking out with the Wake County Public School administrators + faculty! Rock and Roll Team Building with Red Hat! Great energy from the sales team at Simlilearn! If you’d like the DTC experience to be one part of a larger event, we recommend our unique Drum Set Karaoke™ program. This format allows groups of up to 8 people to play along with a live band for 1 song, and has a faster per-group turnaround than our regular team building program. Drum Set Karaoke™ is fun for ALL ages, and is ideal for festivals, cruises, or fairs! — Louise Olson, Zest Events INC.